This is a very handy tool, to help remove and install the bushings in both the brake and the clutch pedals. Clutch disc 1928-40. The 9" spring centre type disc. Better than the type Henry used when new. Brand new 1928-34 Model A / Model B pressure plate. Clutch finger adjustment tool for the Model A and Model B clutch pressure plate. Once the pressure plate & clutch disk are bolted to the flywheel, use this handy tool to help you make sure the all of the clutch fingers are adjusted to the same height. Clutch Pressure Plate 9" 3 finger V8 style. This pressure plate is also, a popular modification to use on the Model A and helps reduce the amount of pressure needed to depress the clutch pedal. To use this on a model A, the flywheel must be machined. No changes in the way the clutch pedal is adjusted. Uses the same 9" clutch disk A-7550. (This upgrade is detailed in our Mechanics handbook volume 2). Clutch disc align tool for the 1928-48 Model A, Model B and Flathead V8. When putting a new clutch disc in your car, this handy little tool aligns the disc before fitting the pressure plate. Set of 12 bolts and lock washers used to mount the model A pressure plate to the flywheel. Grade 8. Made in USA. 1932-40 Pressure plate mount set. These are the six grade 5 bolts to hold the V8 style pressure plate onto the flywheel. Throw out hub 1928-31. The cast hub that the throw-out bearing mounts on. 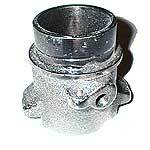 Federal Mogul brand clutch release (Throw out) bearing for the 1928-48 Fords. It is a good idea to replace this bearing anytime the clutch is replaced. Permanently lubed. Clutch release bearing spring 1928-31. 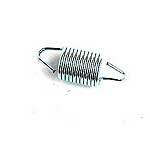 The return spring for the throw out bearing. Also, returns the clutch pedal. Made in USA. 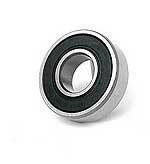 1928-48 Flywheel pilot bearing or generator bearing. The bearing that is pressed into the flywheel for the transmission shaft to go into. Sealed for long life. This bearing also goes in the pulley end of the Model A Ford generator and was used late in 1928 until the end of production. Complete clutch release shaft set for the 1928-31 Model A Ford, complete shaft with bronze bushes and locking pins. Note: Will not work on the early 28 multiple disc style clutch. Multiple disc clutch release shaft 0.875 dia 1928. Very similar to the later style shaft except this one has smaller cross drilled holes and has a key slot in the center for the clutch release fork. Used only on multiple disc clutches. Made in USA. Pedal/clutch shaft bushing for the 1928-31 Model A Ford. These bushing are for the brake and clutch pedals, plus they are also used on bell housing for the clutch release shaft. or the early 1928 Model A with 3/4" shaft). Also used on the 1939 American Ford V8 car and 1942-47 pickup. Clutch shaft arm 1928-31. A replacement style arm for the end of the rod that activates the throw out bearing fork. Originally this was a casting, and quite often the originals get cracked. Made in USA. Clutch release fork for the 1928-48 Ford Model A and V8. Plus 1948-52 F1 to F6 pickup. This is the fork inside the clutch area that pushes against the throw out bearing when the clutch pedal is depressed. 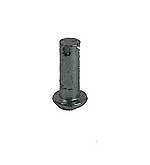 Clutch shaft release pin 1928-31. Two of these pins are needed. One for the clutch fork, and the other for the arm on the end of the shaft. Two of these 5/16" pins are needed. One for the clutch fork, and the other for the arm on the end of the shaft. These were changed to 1 1/2" long in 1932, but will still fit the Model A from 1928 onwards. Fits: 1928-48 Model A, Model B, Flathead V8 and 1948-52 F1 pickup. Clutch shaft release pin with key 1928-29. A 3/16 diameter pin with the key. This was used from the beginning of production until June of 1929. Made in USA. Clutch release fork with key 1928-29. The keyed clutch shaft was used until June of 1929. 3/16 flat headed tubular rivet with the key. Made in USA. Clutch inspection plate for the 1929-31 Model A Ford. This is the metal plate with slotted mounting holes, that attaches to the clutch housing. Clutch inspection plate screw set for the 1928-31 Model A Ford. Set consists of two round headed machine screws and lock washers to hold the inspection plate on top of the bell housing. 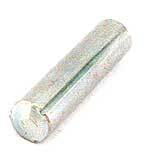 Standard Size Brake rod Clevis pin. Fits all of the brake rods and the clutch pedal fork. 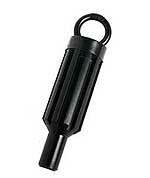 This is the standard size which is 0.310 diameter x 1" long (excluding head). 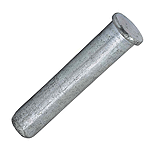 If your pins holes are worn, you can drill them out and put in the oversize pins (A-2463) which are 0.340 diameter. Made in USA. 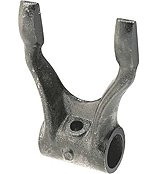 Oversize Brake rod Clevis pin. Fits all of the brake rods and the clutch pedal fork. 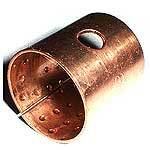 If your pins holes are worn, you can drill them out and put in these oversize which are 0.340 diameter. Made in USA. Clutch Adjusting arm & trunion 1928-31. Attaches to the clutch pedal and the clutch release shaft arm. This is the little guy that adjusts the clutch. 3/8-24 thread. Made in USA. Clutch Trunion Nut Only. This is the nUt that fits into the pedal, for the adjusting arm to screw in to. Clutch adjuster 1928-31. Replaces the stock adjusting arm and trunion. To adjust the clutch, simply back off the jam nut and turn the hex in the middle of the stud. Half of the stud is a left hand thread, the other half is right hand thread. Eliminates having to pull the cotter pin and clevis pin to make adjustments. Made in USA.